The Invitations of the Nine questline is well underway, so let’s take a look at what you need to do over the next nine weeks. Xur’s schedule is set to change this week after the weekly reset. As it stands, he appears in a new location each Friday and stays there until Tuesday. You’ll need to finish the weekly challenge you currently have before he appears again if you want to continue the Invitations of the Nine questline. It doesn’t seem to matter when you start the questline as they aren’t time-barred, so have a look for him today if you want to begin the quest. Each week you’ll have a specific activity to complete as well as collecting samples from defeated enemies. You’ll then travel to the Drifter’s derelict ship where you’ll see some cutscenes with very interesting lore and can claim your rewards. The first Invitation is called The World, where you’ll need to collect samples from defeated enemies in the EDZ. You’ll also need to complete the Lake of Shadows Strike activity to unlock the cutscene and finish the challenge. Once you’ve completed this challenge, head to The Reckoning location in the Gambit Directory to see a cutscene with The Drifter and a mysterious character. For the next Invitation, you’re heading to Titan to collect more sample. You will also need to complete a run of the Savathun’s Song Strike. This week you’ll see a cutscene involving the Emissary as the Nine enquiries whether she regrets joining them. This next Invitation takes place on Nessus, where you’ll need to complete the Inverted Spire Strike and collect yet more samples. 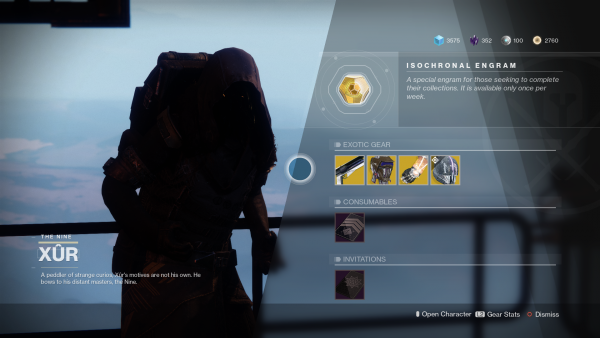 Xur is hiding in the Tower’s Hangar this week, so go and find him before the reset. After completing this we’ll finally get an update on the elusive Mara Sov, who the Nine are increasingly concerned about her. Once you’ve completed these tasks, you’ll need to enter The Reckoning and jump on Gambit medallions to reach the platform above. The Emissary will be having a heated conversation with the Nine about The Drifter, as always. There’s a suggestion from the Emissary that the Drifter can “leave the game” in this week’s meeting with the Nine. Whether that’s an insinuation that you, the player, are the Drifter and can leave the game or the game is another bit of lore entirely remains to be seen. That’s all the Invitations we’ve got so far, so be sure to check back soon. The Revelry begins today and will run until May 7, so jump in to get some new gear and rewards like the Arbalest Exotic Kinetic Fusion Rifle. In the meantime, check out our Destiny 2: Forsaken guide for walkthroughs for succeeding in Gambit Prime, how to get Thorn and Thunderlord, and where to find Xur and his Invitations of the Nine.